On Friday, the National Cathedral, one of America’s most visible Christian symbols, hosted a Muslim prayer service organized by the Council on Islamic Relations (CAIR), The Islamic Society of North America (ISNA), The Muslim Public Affairs Council (MPAC) and the All-Dulles Area Muslims Society (ADAMS) Center. 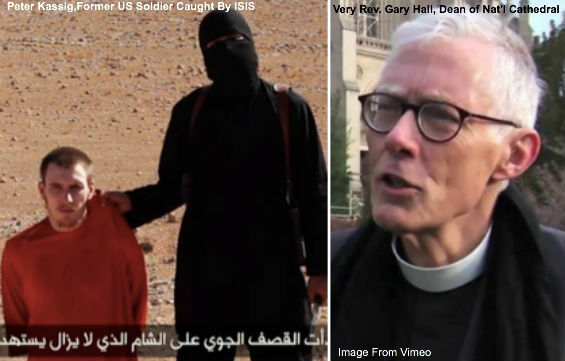 Two days later, on Sunday November 16, it was announced through a horrific video that American aid worker and former Army Ranger Peter Kassig had been savagely beheaded by his radical Muslim captors. The organizations participating in the National Cathedral “prayer event” have documented ties to the Muslim Brotherhood terrorist organization, which Eman Nabih called "the parent of all terrorist groups, including ISIS." The Council on American-Islamic Relations (CAIR) along with the Muslim American Society were on November 15, the day after the National Cathedral service, designated as terrorist organizations by the United Arab Emirates (UAE), a Muslim country allied with the U.S. against the Islamic State. Other groups the UAE designated as terrorists include al-Qaida, al Nusra, Boko Haram and the Muslim Brotherhood. In the Holy Land Foundation prosecution, the largest terrorism funding trial in U.S. history, CAIR was listed as a member of the U.S. Muslim Brotherhood’s Palestine Committee and an unindicted co-conspirator. So there’s no question that the National Cathedral’s guests have close ties to radical Muslim terrorism and that at a minimum they facilitate funding the groups that have killed, and are killing, Americans, such as Peter Kassig. Hall went on to state that “I’m aware that they [the Muslim Brotherhood]are the legitimately elected government of Egypt,” which is much like saying that the Holocaust was OK, because after all the Nazis were the “legitimately elected government” of Germany. If the Muslim service at the National Cathedral on the 100th anniversary of the last Ottoman Caliph’s Declaration of Jihad that started the Armenian Genocide was only a “prayer event” it might be worth inquiring for what exactly did the participants pray? Not long afterward, and clearly unnoticed by his witless hosts, says Bostom, Rasool invoked the Koran’s vitriol towards Christian societies, and indeed all non-Muslim civilizations that refuse to submit to Sharia-based Muslim order, quoting Koran 3:26 “O Allah! Possessor of the kingdom, You give the kingdom to whom You will, and You take the kingdom from whom You will, and You endue with honor whom You will, and You humiliate whom You will. In Your Hand is the good. Verily, you are Able to do all things.” Authoritative classical and modern glosses on this anodyne-sounding verse, says Dr. Bostom, reveal its inherent threat of violent jihad conquest by Muslims—with past Byzantine and Zoroastrian Persian historical experiences as prologue. Following Ambassador Rasool’s sermon, at least one iteration of Sura 1, verse 7, from the Koran’s short opening chapter of 7 verses, the Fatiha, was recited. According to Dr. Bostom this translates as “Guide us to the straight path, to the path of those you have blessed, not of those who incurred [Your] wrath, nor of the misguided…” The al-Fatiha, 1:5-7 mentions two groups of people, but do not say who they are. However, the Prophet Muhammad interpreted those who incurred God’s wrath as the Jews and the misguided as the Christians. In advance of the November 14, Muslim “prayer event” at the National Cathedral we suggested that Dean Gary Hall and Cannon Jan Naylor Cope cancel the service sponsored the Muslim Brotherhood-connected organizations and instead issue a statement in remembrance of Christian martyr Father Petrus Terzibashian and the millions of forgotten Christians killed in the jihad-inspired Armenian, Assyrian and Greek genocide. Today we urge CHQ readers to contact the leadership of the National Cathedral and urge them to invite their Muslim guests back to join them in offering a prayer for Peter Kassig and his family, and then demand that Dean Hall offer a public apology for advancing the organizations that funded Peter Kassig’s killers and repudiate his previous statement that there is moral equivalence between Christians and radical Muslim terrorists. Email The Very Rev. Gary Hall at [email protected]. Email The Rev. Canon Jan Naylor Cope at [email protected]. Email National Cathedral Chief Development Officer Rita Walters at [email protected]. *Hat tip to our friend Diana West for clueing us to Dr. Andrew Bostom’s article. Here’s Breitbart’s astonishing “moral equivalence” interview with National Cathedral Dean Gary Hall. Here’s the video of the entire Muslim “prayer event” at the National Cathedral. Here’s an article by Eman Nabih briefly explaining the ties between the Islamic State and the Muslim Brotherhood. Submitted by OldmanRick on Mon, 11/17/2014 - 13:41. If true to form, Muslims will not claim the National Cathedral as a mosque since they have prayed there.